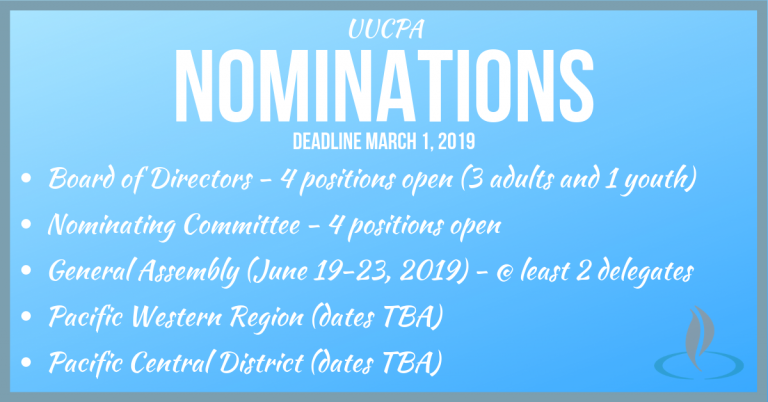 Nominations are open for the UUCPA Board, Nominating Committee, etc. The Nominating Committee is preparing the slate of candidates for the congregational vote at the UUCPA Annual Meeting on April 14, 2019. We would like to hear from any member who is interested in serving our community for these very important positions no later than March 1, 2019. See below for more details. Once we establish the list of nominees it will be published in the March Bulletin. 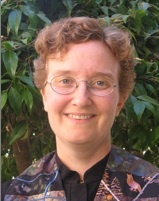 Per the by-laws, additional nominations can be included until early April by submitting a petition to the Nominating Committee signed by the nominee and at least three other church members. The Nominating Committee members are Bill Hilton, Tyler Kochel, Diane Meier, Geoff Ivison, and Lisa Helmonds. Please feel free to talk with us to answer any questions you may have. Remember, serving in this way helps preserve our wonderful community and ensures it will remain vibrant. Thanks for your consideration. General Assembly (GA) is the annual meeting of our Unitarian Universalist Association (UUA). Attendees worship, witness, learn, connect, and make policy for the Association through democratic process. General Assembly 2019 (June 19-23) will take place in Spokane, WA and online. Pacific Western Region – TBD Still waiting for details. Pacific Central District – TBD Still waiting for details.